The JSB: Did Albania steal Bush's watch? Did Albania steal Bush's watch? This was too much for Bush's hysterical legion of haters, whose insecurity is such that they only feel comfortable when new Europe despises Bush as much as they do. 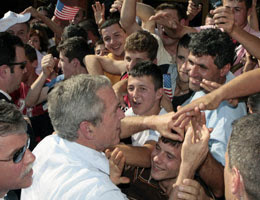 So, with the help of Albania's sensationalist local media, these bitter critics have developed a narrative that suggests this whole celebration of Bush was an elaborate plot to get him to let his guard down long enough for Albania to steal his watch. There is even a video tape-- as doctored as it is confusing -- to support the claims of the well-planned pilfering. I, for one, believe the White House when it suggests the reason why Bush's watch appears to disappear during his interaction with the crowd was simply that Bush took it off and put it in his pocket. Bush might not be an expert when it comes to understanding foreign cultures, but even he will eventually realize it is not a good a idea to tempt a crowd of Gypsies -- even an adoring crowd of Gypsies -- with a shiny watch.